C4 House Party proves a triumph for domestic New Year celebrations, sparks a social media frenzy and reminds us of Channel 4’s unique place within UK TV broadcasting. How compelling can it be to watch DJ’s spin records inside an empty TV studio, for 6 whole hours? If you tried to explain to the uninitiated as to just why you HAD to stay up all of last night to witness it, you might struggle. As it happens, Channel 4‘s House Party NYE (New Years Eve) could prove already to be 2013’s top televisual event. Last night’s show was in fact a follow-up to a debut back in August, which at the time seemed like a one-off celebrating some kind of anniversary for House music. The combination of top international DJ’s, renowned video artists and viewer interaction thankfully proving enough of a winner to make it a recurring fixture. That said, C4 House Party will be of absolutely no interest to those who dislike contemporary dance music. Sure there’s a bit of ‘old school’ Soul and Disco thrown in for good measure, but this is more likely to be in line with Channel 4’s ‘Yoof TV’ roots when it comes to target demographic. However the programme should be congratulated for being wholly inclusive in presentation – it invites everyone and let’s face it, no one can judge you pogoing in your own front room. In fact C4 House Party’s discerning lack of pretension is exactly what makes it work. The studio set is remarkably understated, built to resemble a circular DJ booth capable of containing minimal crew. More importantly the producers have resisted the temptation to imitate an actual nightclub. There isn’t a TFI Friday-style audience or a throng of attractive pouting morons bobbing in front of the cameras. Can you imagine how obnoxious it could have been if the vacuous cast of E4’s Made in Chelsea had been allowed in? No, if the carpet feels tacky underfoot then it’s your own fault. It is precisely this decidedly lean, underground approach that makes C4 House Party so credible. It also helps to reaffirm the ambition and core values of Channel 4, offering the station an increasingly rare chance to surprise. We might not be in prime time territory here folks, but it still takes balls to pull off an extended advert-free broadcast so expertly. Makes you proud to be British and god bless Channel 4 quite frankly. The music is of course the real star though, and ideal for dusting off your Surround Sound Home Cinema. Each DJ gets roughly an hour to do a continuous mix, largely uninterrupted. Introductions and handovers are handled by ebullient hip-hop artist Charlie Sloth, a guy who traverses the edges of annoyance expertly given his portly frame. Last night’s House Party included legendary names such as Norman Jay MBE and Frankie Knuckles, so the quality of set can’t be understated. Particular praise here should go to BBC Radio 1‘s Annie Mac who was the only DJ making a return from August’s outing. Her choice of ‘choon’ after ‘choon’ is consistently brilliant and kicking off last night with Daft Punk‘s classic ‘Teachers’ was an inspired move. Do note you can now listen to each DJ’s full set again at MixCloud.com. Judging by the barrage of Tweets via @C4HouseParty (including mine) the show ushered in New Year beautifully for many of us too boring to actually go out. It’s debatable whether the broadcast is indeed performed live as billed, logistically it really needn’t be, but C4 House Party succeeds most in conjuring a collective, communal spirit. Hopefully we’ll see it make strategic appearances in 2013 without the kind of unnecessary format changes it really doesn’t need. 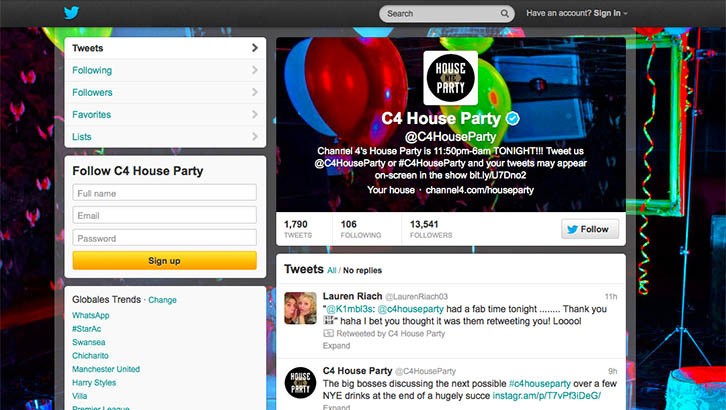 Official: C4 House Party follows Mark Billen.com!